Let me just preface that this post is filled with waaaaaay too many photos of myself. I am very much out of my comfort zone. Yep. 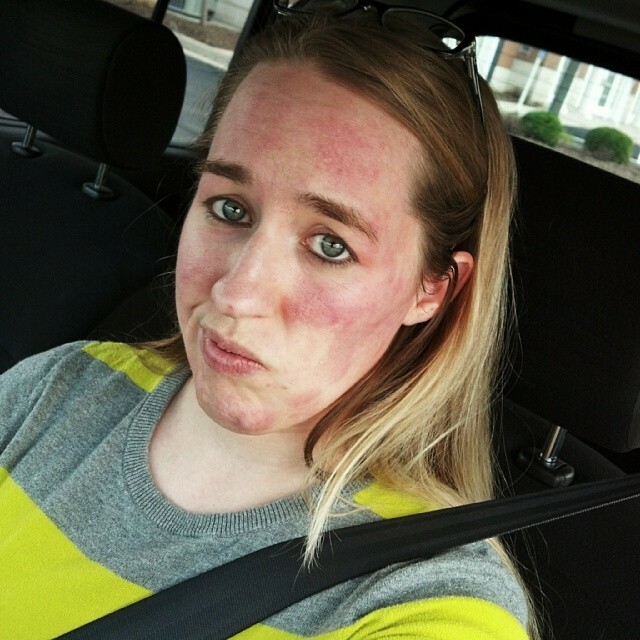 A couple months ago, I ended up with a severe allergic reaction to some expired Proactiv moisturizer. I haven’t had an active subscription with them for a few years now (I think I stopped it a few months after coming home from Japan, so 2010-ish), but no matter how long I scheduled the intervals for delivery, I still had way more product than I could use. So, I did what any normal human being would do – I kept it stocked away until I went through each bottle. Not any more. I needed an extra little boost to my skin one morning, so I smeared some of the medicated (should have been my first warning) repairing lotion on my face, like I was wont to do every 4 days or so when I remembered, and walked out the door to work. About 45 minutes after getting to work, my chin started to itch…and then my cheek right under my right eye…and then my forehead. I asked a coworker if my face was red and her expression was all I needed. 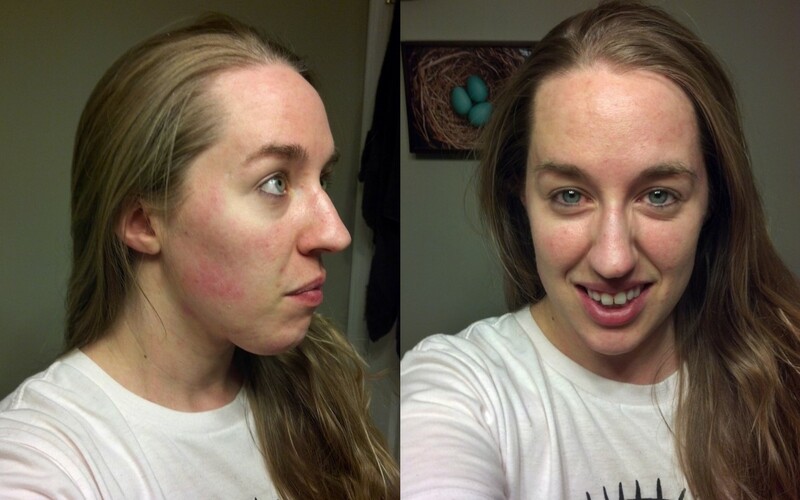 I went to the bathroom to check my face, and just about every spot that I had rubbed the lotion in was bright red. And itchy! I wasn’t getting hives, but the reaction was so much. My skin was hot, itchy, and just a mess. Like I’ve said, I’ve been using Proactiv for years, I’ve been using lotion from old bottles for years too, and I’d NEVER had a reaction like this before. Sometimes my skin decides to turn into a 13 year old monster, but for the most part, my skin is pretty OK. I had recently switched birth controls (now I’m using Sprintec…and loving it! I might do a review on my experiences with Sprintec vs Lo Loestrin a bit later) so I called the pharmacy to be sure there was no recorded reaction between the two. They had nothing, in fact, they said there should never be a reaction like that. I called my doctor and the nurse who answered told me that I was having an allergic reaction, that sometimes the medicine inside things like that just get stronger as the expiration date flies into the past. She recommended I go and get some Benadryl and gently wash the stuff off my face with just water. I took the picture above as proof of what had happened, and the next time I went to the doctor, it was passed around the office. General consensus was that I had a chemical burn. If you have something with medication, or prescription drugs, or even over-the-counter meds – be very cautious of the expiration dates. The doctor told me that it is common for people to hang on to medicine (guilty as charged) long after the expiration date and when they have a certain symptom, they will take it because it “worked before and is probably just weaker the older it gets.” WRONG! The chemicals in medication can, and usually will, get STRONGER as time goes on. It’s more potent and effective and sometimes it will even change into a whole new chemical! Rule of thumb is, if it’s past the expiration date, toss it. And by toss it, I mean, find a local prescription medication drop-spot so it can be destroyed properly. That does not mean, throw it in the garbage, or flush it down the toilet. That just makes it available to people who might have addiction problems or messes up the public water system, respectively. The secret ingredient? Tiny bits of silver have been infused in the microfiber. The grade of silver they use is actually antibacterial, so the cloth can even clean itself (I’ve had mine for as long as this post title suggests and only just washed it for the first time. The microfiber also has an exfoliating aspect to it. I took these pictures soon after the chemical burn had gone away, I was also gearing up for a cycle of breakout on my skin. I know that there’s more lighting in these second set of pictures, but I’ll explain how my skin has changed since using the Norwex Body Cloth. I love the exfoliating aspect of this cloth. That’s one of my big issues, dry patches of skin on my face, and I have had a dramatic decrease in that regard. 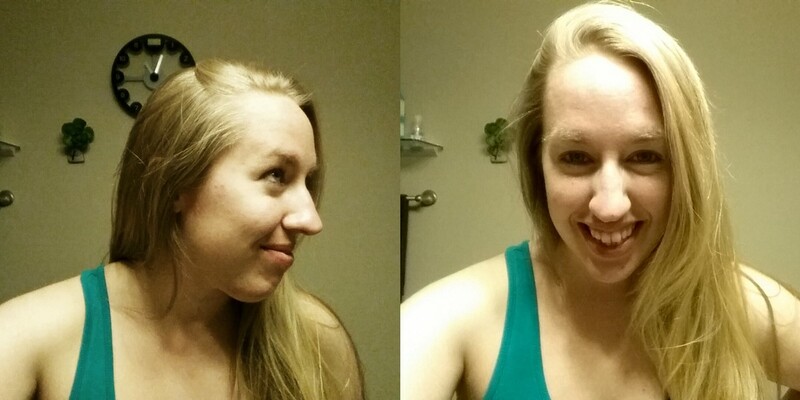 My skin feels perkier, softer, and overall, healthier. 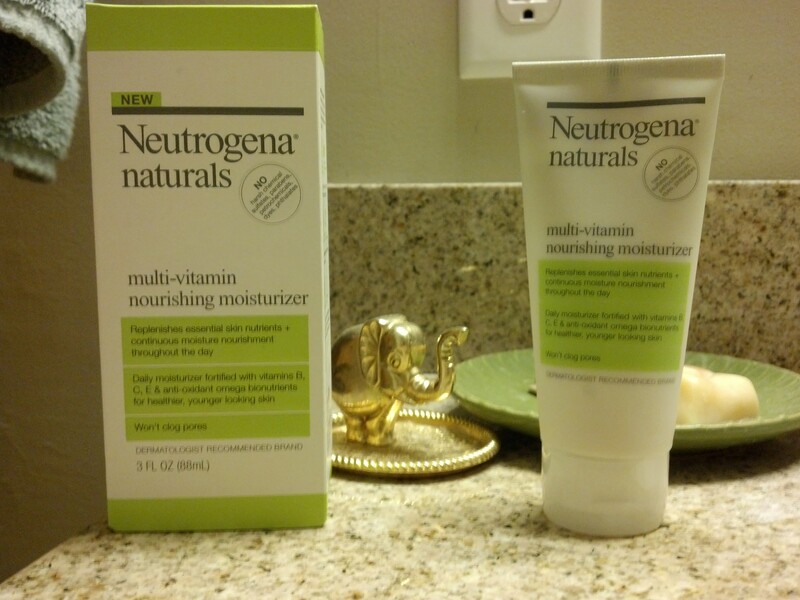 When I first started using it, using “just water” was kind of drying out my skin, so I bought a Neutrogena naturals moisturizer. I’m avoiding anything with medication, but this moisturizer is rich with vitamins and anti-oxidants. I will say that I still get breakouts, but they don’t seem to be lasting as long as before, and they don’t seem to be as deep either, which is fabulous. My skin will never be perfect, with any product, but this really seems to be helping my skin get better. If you are like me and about 50% of the world’s population and suffer from keratosis pilaris, this is a pretty great product. The short version of the condition is that my skin grows over my hair follicles. This happens on my arms, legs, and chin, mostly, and makes for bumpy, rough, and sometimes redden skin. Keeping skin moisturized and exfoliated is a great, non-medicated way to keep these bumps down. If you are interested in learning more, go to the Norwex website and read up! Like I said, they have all types of products besides Body Cloths, so check out the goods and revitalize your home in a clean, safe way. Also, if you’re looking for a consultant, feel free to check out the website, or contact my friend, Kristy Gantz. I know she would be glad to chat with you. You can find her here: http://www.kristygantz.norwex.biz/. You can also give her a call here: -[o925]. Oh, and she’s on Facebook! This entry was posted in Businesses, Review. Bookmark the permalink.